It’s the flagship event for the European Tour this week, as a loaded field heads to Wentworth to try and dethrone two-time defending champion Luke Donald at the BMW PGA Championship. Whenever he tees it up, Rory McIlroy takes a lot of the focus, and this week will be no different. Between his “struggles” to start 2013 and his recent decision to abandon his management group to go solo, McIlroy has a lot going on at the moment. He’s going to be looked at as a serious contender this week and he should be based on his ability, but Wentworth hasn’t always been kind to the former world number one. In five events, he has one top-10 finish, a solo fifth back in 2009. Outside of that, he’s got a T-24, a T-48 and two missed cuts, including last year where he fired a dreadful 79 in Friday’s second round. With that kind of track record, it shouldn’t be a surprise if he doesn’t do that well, but it’s going to be a big focus regardless. The other thing that I’m going to be paying attention to is the play of Sergio Garcia. We’re a couple of weeks removed from his meltdown and controversy at the PLAYERS Championship, the latest in a long line of drama with Garcia. In terms of his form though, he’s probably never been better. Even with his collapse, he finished tied for 8th, extending his run of top-25 finishes to 17 straight worldwide. It’s his first trip back to Wentworth in over a decade, having last played the course at the 2002 HSBC Match Play, but he’s always fared well at the course, never finishing worse than a tie for 19th. Update: Since writing this, Garcia made his “fried chicken” comments towards Tiger Woods, which would qualify as his latest bit of drama. Just makes things even more interesting for this week. 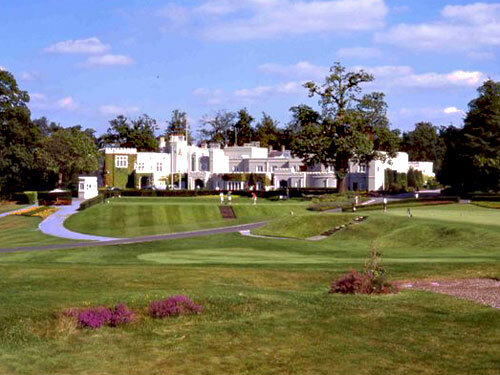 The West Course at Wentworth is one of the more famous venues in European golf, having hosted the 1953 Ryder Cup, the HSBC Match Play from 1964-2007 and this event since its inception in 1984. The headquarters for the European Tour are also on the grounds, and the course is frequently present on lists celebrating Europe’s top courses, ranking in at number 85 on Golf Digest’s most recent compilation. Harry Colt designed the course way back in 1926 and it was modernized to much criticism by Ernie Els just a few years ago. Wentworth West is an oddity in the modern game in that despite the par-72 layout, it goes out in 35 and comes in in 37, with three par-5’s on the back nine, including the two finishing holes. Many observers feel that’s what made it an exciting Match Play layout, as the final two holes would usually force players to make birdie in order to stay ahead of their competition. Since the Els redesign, the back nine has played considerably more difficult, with three of the four toughest holes on the course coming in a stretch from 13 to 16. Luke Donald: He’s won it in each of the last two years, and even if you threw those two events out, he’s had a ridiculous run at Wentworth. Outside of the two wins, he has a runner-up, a third, a T-7, T-18, T-25 and T-35. He’s also had good finishes at the Match Play when it was there, so you’d have to think that he’s going to be there at the end. Trying to become the first player since Colin Montgomerie to win three straight BMW PGA’s. Rory McIlroy: As mentioned above, the track record isn’t there for McIlroy, but it’d be foolish to count him out. He has started to play better, with five top-25 finishes in his last six starts, including his runner-up to Martin Laird in Texas. Lee Westwood: He’s got nearly as much experience as anyone else at Wentworth, with much of his success coming in the Match Play format. He’s been runner-up twice in this event here, including two years ago, but he’s also got six missed cuts. Still in better form than most, with four consecutive top-10’s, all on the PGA Tour. Justin Rose: Usually hit or miss here, with two top-10’s and two missed cuts in his last four events at Wentworth. Before his missed cut at the PLAYERS a couple of weeks ago, he was one of the hottest players in the world. Still looking for his first win in all formats at Wentworth in his 12th start. Sergio Garcia: Still on a great run of form, but it’s been a long time since he’s seen the course, and he hasn’t played it under the new Els redesign. There’s an argument to be made that he’s the most talented player in the field not named McIlroy, but we’ll have to see how he bounces back after his most recent setback. At the beginning of the year, I wasn’t crazy about Westwood’s chances to do much of anything, especially after he fired longtime caddie and friend Billy Foster, but he has impressed me with the way he’s played. Six top-10’s worldwide, including the last four events he’s teed it up in on the PGA Tour, and even though he hasn’t won one of those yet, it seems like it’s time for him to break that streak. He shouldn’t put himself in too much trouble off the tee, but even if he does, he’s usually a good enough scrambler to get out of it. As mentioned above, I do like his track record here as well. I’ve always been a huge fan of Kaymer, and if last week is any indication, we could be seeing the former world number one rounding back into form. He finished tied for fifth at the Byron Nelson, where he ranked 11th in GIR and 3rd in scrambling. Outside of a missed cut in 2010, he’s had nothing terrible at Wentworth, finishing no worse than a tie for 31st in six tries. At the very least, I think he gets inside the top-5 again this week. Even before Els redesigned the course, there is probably nobody who knew the layout better than him, as this will be his 25th appearance at Wentworth since 1996. In those appearances are fifteen top-10 finishes, along with five wins in the match play format and two runner-ups in stroke play. He finished tied for 7th last year, and even though he only has one top-10 finish this season, the price seems too good to pass up considering his track record. I say it a lot with guys like Manassero, but anytime you can give me a player who putts and scrambles like him at this kind of a price, you take it. Finished tied for 7th here in 2011, but hasn’t had the kind of year that was expected of him coming in to 2013, which explains why you can get him at this kind of a number. I don’t think he wins this week, but a good finish doesn’t seem out of the realm of possibility. There are few golfers on the planet right now that have the consistent results of Jaidee over the last six months. Twelve finishes inside the top-20 in his last sixteen worldwide events, including going to the finals last week of the Volvo Match Play against Graeme McDowell. Even though he lost that match, his showing was more than impressive, defeating Ian Poulter, Thomas Aiken twice, Peter Hanson and Scott Jamieson. His record isn’t great at Wentworth, but he’s only missed one cut here in ten career events. Goosen knows the course in the same way that Els does, with this being his 25th event since 1996 at Wentworth as well. He hasn’t had the kind of success that Els has enjoyed, but he does have eleven top-10 finishes here in his career. It’s been a bit of a slow start for him since his return from off-season back surgery, but if he’s going to play well, Wentworth is as likely a spot as any other. And at 227-1, it’s a no brainer, especially on an each-way bet.